All the pages in the mini-album is covered with gesso. 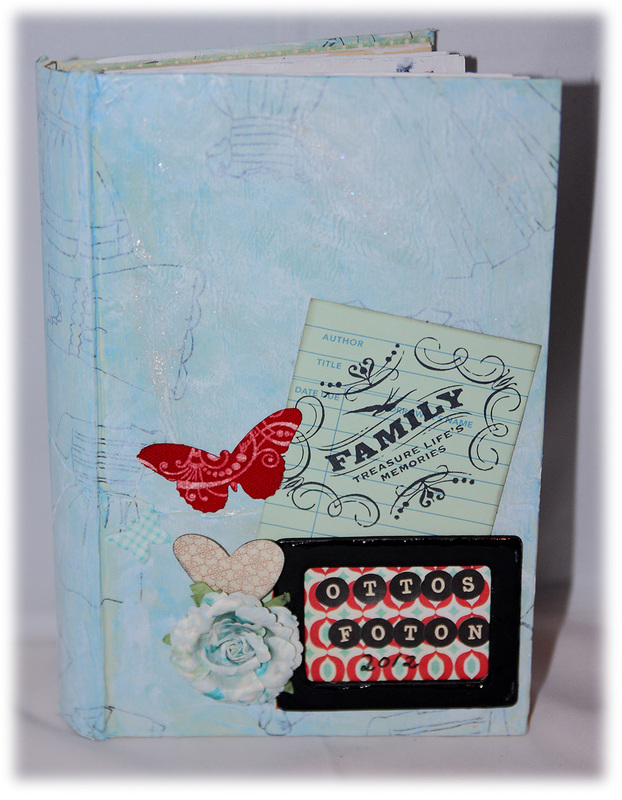 Here I have used acrylic paint on the background and then added paper and embellishments such as a journalingcard and stickers. 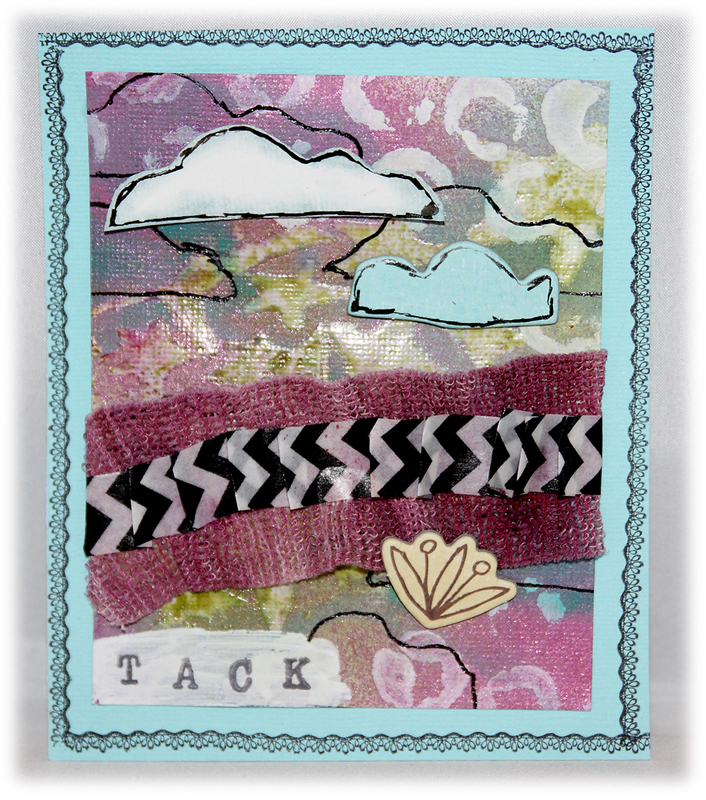 A while ago I participated in a altered mini-album class att Cocoa Daisy. I learned how to create a mini-album from a ordinary book. I started with cutting out some pages in the book to get more room for decorations. 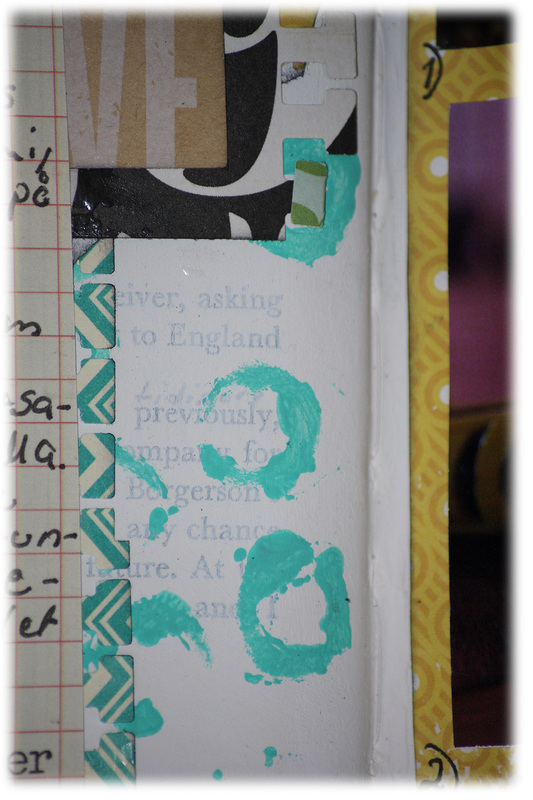 Then I glued a couple of pages together to get them more sturdier. The cover was made in several layers; I first covered the whole book with white gesso, then a layer of tissuepaper and decoupageglue, on that a layer of lightblue acrylic paint and then a layer of white acrylic paint and some Blingz for the blingbling feeling:) The last thing I did was to cover all this with a layer of decoupageglue. And then it was time to decorating…de fun part!! Här har jag gjort en mixed media sida i mitt grungeboardalbum. 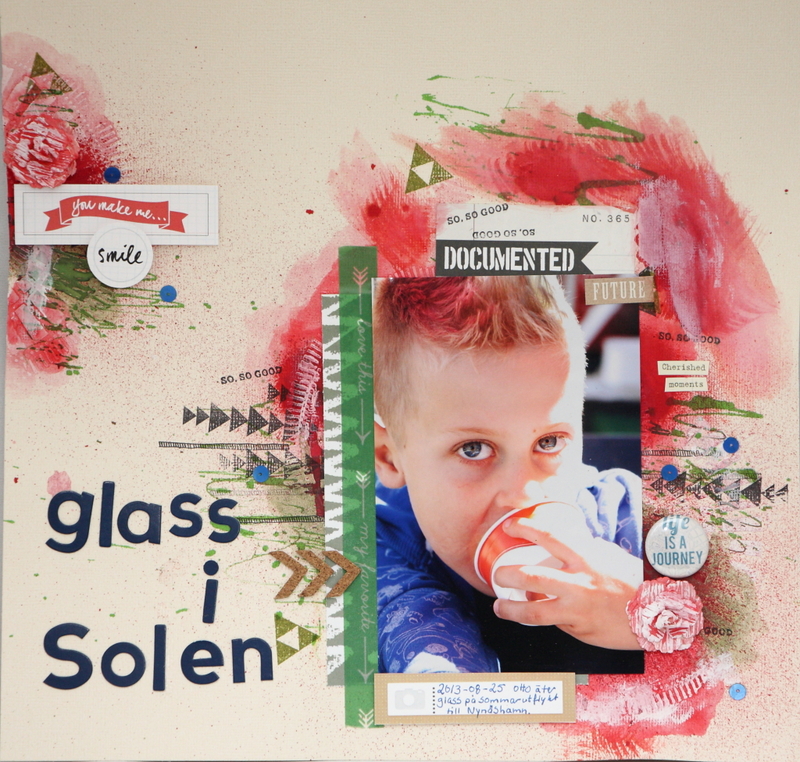 Som grund har jag decopagepapper och ovanpå det har jag använt gesso, stenciler, akrylfärger. Fjärilarna och den lilla ängeln är mönsterpapper från Pink Paislee. Utgångspunkten var en skiss i Svensk Scrapbookings Midsommar crop. I have made a mixed media page in my grungeboardalbum. 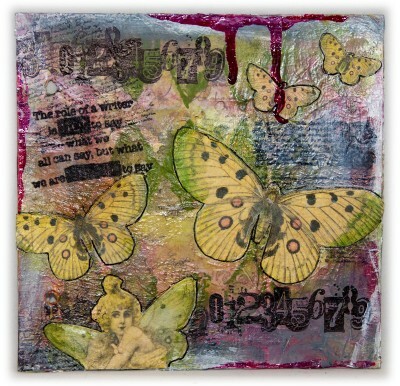 As background I have used decoupagepaper and on top of that I have used gesso, stencils, acrylicpaint. The butterfly and the little angel is patternpaper från Pink Paislee. 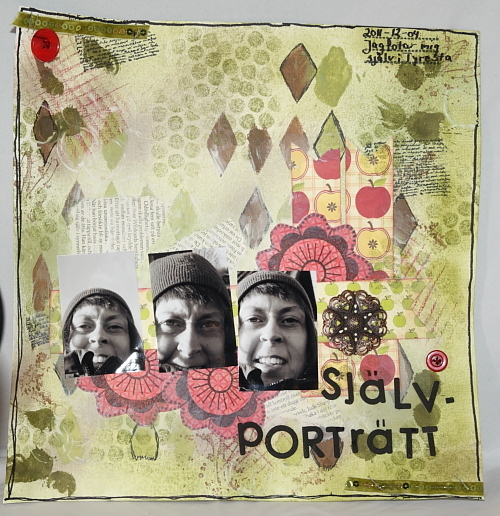 The starter for this mixedmedia page was a sketchchallange in the forum Svensk Scrapbooking midsummercrop. Här ser man tydligt strukturen som blir av alla lager, medium och decpoupagepapper. Färgen på vingarna har jag förstärkt med Fiber Castells Big Brush Pens. 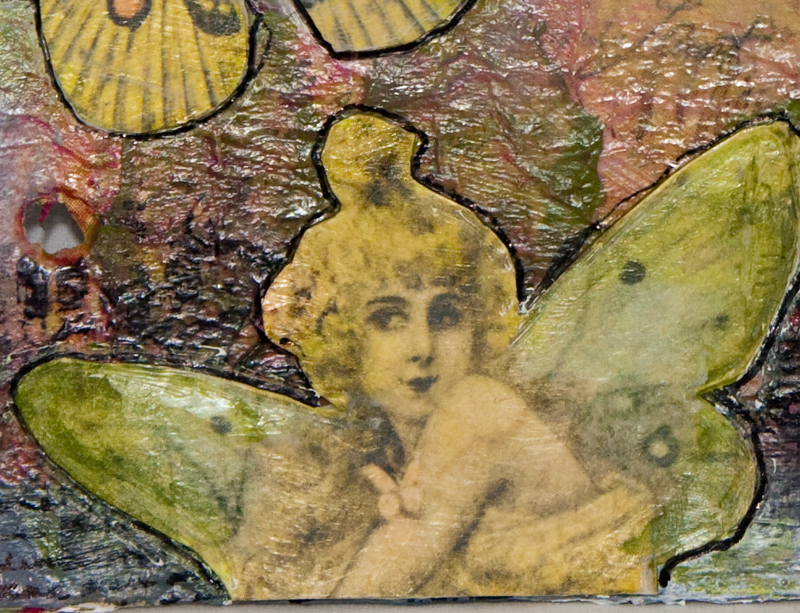 On this closeup you can see the structure from all the layers, mediums and decoupagepaper. I have used Fiber Castells Big Brush Pens on the wings. För ett tag sedan var jag på eventet ”Scrapbooking med hjärta”. Den här canvastavlan är mitt resultat från en workshop med Nathalie Kalbach, en fantastiskt duktig och inspirerande mixed media artist från Hamburg. Jag har ”stämplat” med hjälp av stenciler i ett tjockt lager med gesso tillsammans med gasväv och metalldekorationer och slutligen med flera olika mistsprayer. Här är ett foto på mig, ett av få där jag inte blundar:). Vi hade jättekul under tiden vi gjorde våra tavlor och eftersom det är så lång torktid mellan lagren fanns det mycket tid att prata med både nya och gamla scrapvänner. 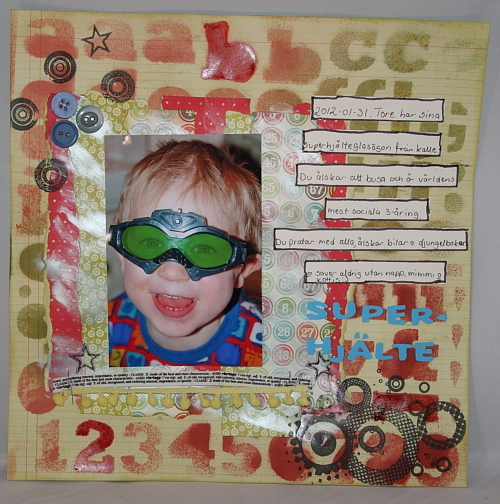 For some time ago I went to the scrapevent ”Scrapbooking med hjärta”. This canvas is my result from the workshop with the very talented mixed media artist, Nathalie Kalbach from Hamburg. 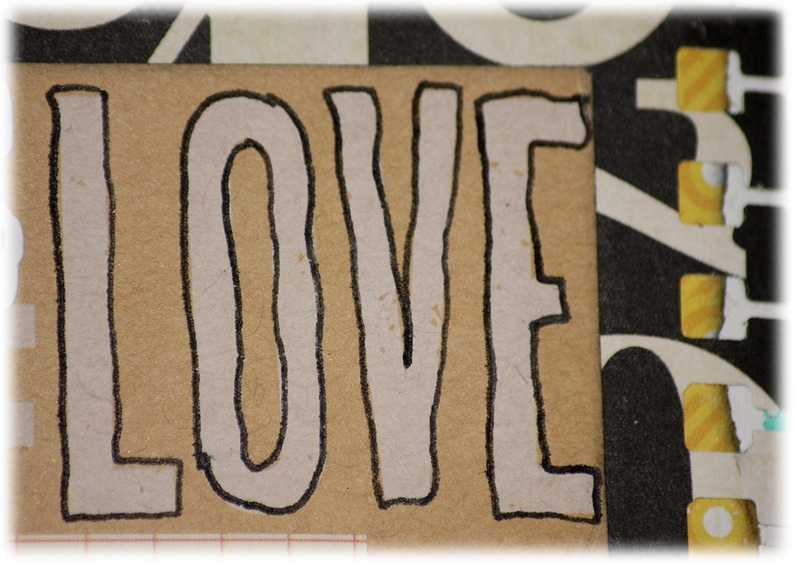 On the canvas I´ve ”stamped” stencils into gesso for some structure and dimensions. Then I added some gauze and metaldecorations and then different mists. Here is one of few photos of me when I´m not closing my eyes. I´m expert on that when I´m infront of the camera:). I had a great time doing this canvas. It takes a lot of time to dry between the layers so there was a lot of time to talk with both new and old scrapfriends. This layout is made for a sketchchallenge. I have played with gesso, a harlekinstencil, two different colour of green mist, bubbleplastic and wellpapp. I have stamped and cut out the red flowers. The paper with apples from Jillibean Soup is one of my absolute favours right know. I try to expriment more on my layouts and ”let it go” when I create. It´s a way that really suites me well! I enjoy it even more now! I have used the rest of a alphabet as a mask. 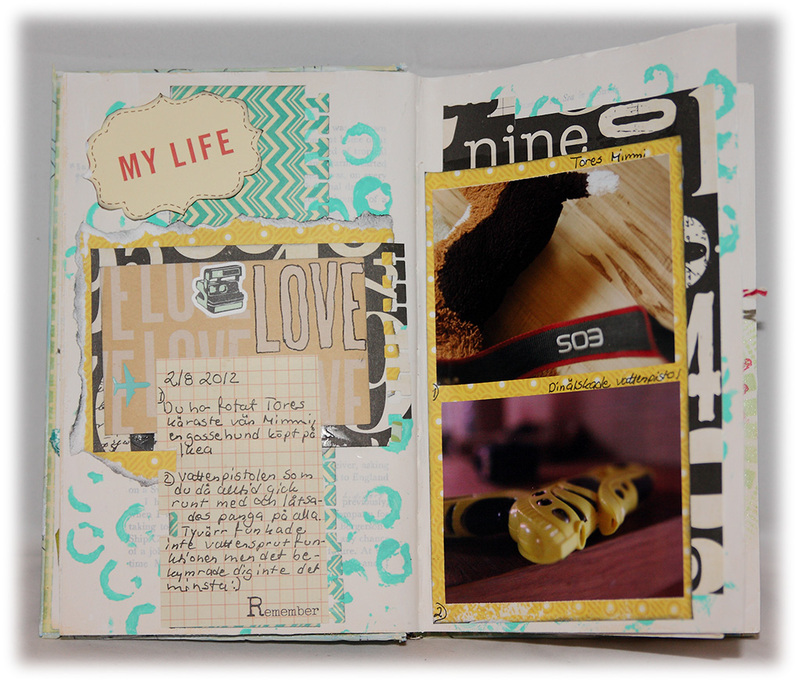 I always write some journaling on my layouts but I usually don´t let them take up much space. 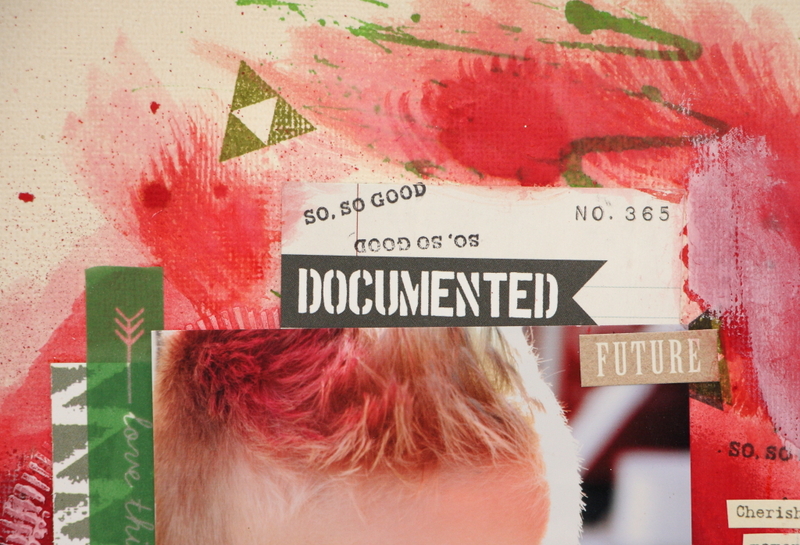 I really like this journaling. And I have decided to write journaling like this more often on my layouts. The only limitation is your imagination! Jag har hoppat på Scrap-Perras utmaning för första gången. Det var en skissutmaning och skissen ser ut så här. Dedline var i går så nu pågår röstningen för fullt. Spännande! Jag mistat med Tattered Angels mist ” Key Lime Pie”. Die-cutpappret kommer från Websters Pages ”Trendsetter”. Rutigt papper från Graphic 45. De två banden har jag sytt fast på maskin och blommorna är vita pappersblommor som jag färgat in med samma mist som bakgrunden liksom tagen. Chipboardhjärtat har jag lagt ett lager vitgesso som jag droppat röd distressfärg i och sedan stämplat stjärnor på. 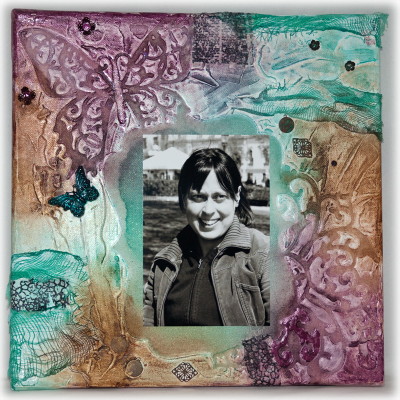 I have participated in Scrap-Perras challenge for the first time. It was a sketchchallenge and here is the sketch. Dedline was yesterday, Januari 31th so the woting is ongoing right know. Its so exiting! I have used Tattered Angels mist ”Key Lime Pie” on the cardstock. 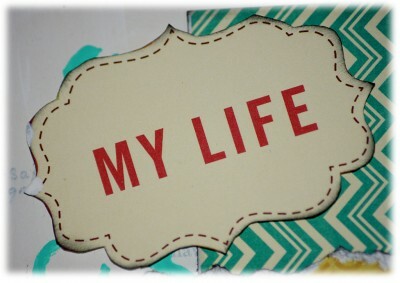 The die-cut paper is made by Websters Pages ”Tre Trendsetter”. The plaid paper is from Graphic 45. The tag and the green flowers is coloured with the same mist as the background paper. I sew the ribbon in place with my sewingmachine. 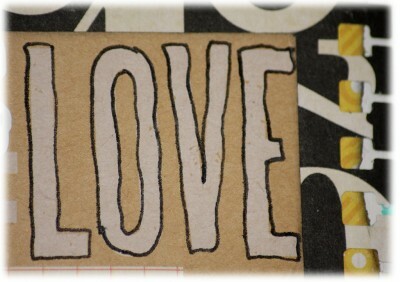 I put a layer of gesso blended with some drops of Rangers ” Fired Brick” on the chipboardheart. 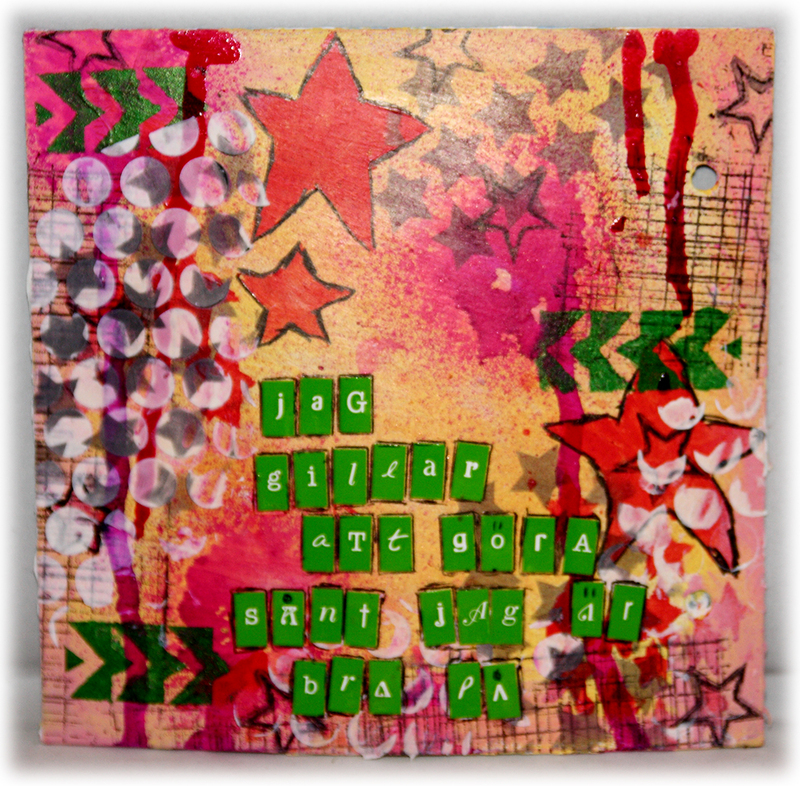 Then I stamped small stars on it. The letters is from Cosmo Cricket and Prima. "Bara fem minuter till" - "Only five minutes more"